Albany, NY - June 29, 2015 - The northern cricket frog will be protected and populations restored in New York State under the final management plan for the amphibian released today, DEC Commissioner Joe Martens announced. The final Northern Cricket Frog Recovery Plan is now available on DEC's website. "The northern cricket frog is an important amphibian component of wetland ecosystems in southeastern New York," DEC Commissioner Martens said. "Conservation of the northern cricket frog and its habitat is important to conserving New York's biodiversity and unique character. Recommendations in the plan will stabilize and improve the distribution and abundance of this rare amphibian and ultimately increase its population. 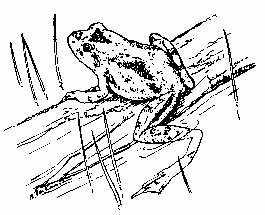 The northern cricket frog is New York's only endangered frog and is limited to a handful of breeding populations in southeastern New York. The recovery plan provides a comprehensive review of the northern cricket frog and details a strategy for preventing the loss of this species from the state. proactively incorporate climate change predictions into management alternatives to give northern cricket frogs the opportunity to flourish in a changing climate. Recovery plans are not required for endangered species in New York State. However, under regulations implementing the New York Endangered Species Law, a recovery plan can be prepared to provide guidance for activities to improve the status of the species and establish a strategy for securing the species and removing it from the NYS Endangered Species List. DEC biologists will now develop specific steps to implement the recovery plan, beginning with research to quantify the upland habitat requirements of the frog. Additional information on the Northern Cricket Frog, including the Recovery Plan, visit DEC's website. Subject: LongIsland.com - Your Name sent you Article details of "DEC Releases Final Northern Cricket Frog Recovery Plan to Restore Amphibian's Population"